A union is asking Aberdeen City Council if procedures are in place to deal with asbestos-related incidents. The Freedom of Information (FoI) request by Unite comes after BBC Scotland revealed 25 people were allowed into Bridge of Don Academy after asbestos was disturbed. Asbestos was also found at Hazlehead Academy. The FoI request asks how many incidents have been recorded in Aberdeen in the last year. It also asks how many workers have potentially been exposed to asbestos. 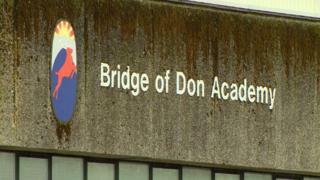 Twenty-five people were allowed into Bridge of Don Academy after asbestos was disturbed due to a series of failures in dealing with the incident, a report revealed. Teachers, janitors, cleaners and other workers were on the premises in the days following the incident. A council investigation report revealed there was no emergency response as a line manager "forgot" about the incident for five days. A spokesman for Aberdeen City Council said at the time: "The health, safety and wellbeing of staff, pupils, contractors and all visitors to schools is a priority and Aberdeen City Council has robust policies, procedures and training in place in relation to asbestos."